Jenn at "You know...that blog?" 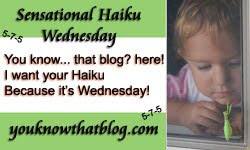 hosts Sensational Haiku Wednesday, stroll over and check it out! Woohoo! I'm with you! Good one - tasty! yummmmmmy! now i'm hungry!!! great haiku! Me! I want one! Toast my marsmallow a little on the dark side, but don't actually burn it. Yum!